In this chapter, we provide a high-level view of various case studies that include deviant acts , deviant events , and deviant groups . 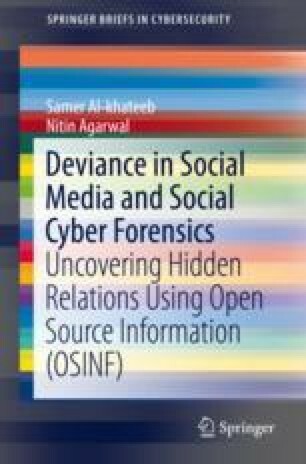 This chapter utilizes the concepts, tools, and methodologies that we presented throughout this book to study, analyze, and have a better understanding of many real-world deviant events, acts, and groups. Here, we briefly highlight case studies of the work we conducted during many deviant cyber campaigns that were projected against NATO forces. In addition to these cases, we shed light on the deviant cyber campaigns conducted by the so-called Islamic State, also known as ISIL, ISIS, or Daesh . We will highlight the major findings of these cases and point the interested reader for more details to other published literature.